Welcome to our Official Ambassador page! We sought out individuals from all walks of life, from around the world who could genuinely attest the long term benefits of using our products. We are honored to work with this bright, beautiful group. Share your story with us for a chance to be featured or be a part of our team ! I’m a bit of adrenaline junkie with passions for slightly more risky sports, such as kitesurfing. I would spend weekends and holidays following wind sources, often across the world. After sustaining multiple injuries over time, I had to take it easy on the water and turned into aerial arts and deep sea diving, and eventually attained a PADI rescue certificate. I soon discovered I was relatively strong but quite inflexible. Some people recommended Yoga, I couldn't think of anything more unsuitable to my personality, but I decided to give it a try. Soon I learnt yoga was not just stretching in fancy pants nor breathing deeply in lotus, I discovered world of inversions, handbalances, tricky transitions and beautiful flows. My body and mind were challenged in every single class and I got hooked. I also developed strong home practice and in 2017 took YTT 200h and started teaching occasionally (I have full time office job). In my yoga practice I enjoy the most being upside-down and on my hands, love all inversions and handbalances. But because I have always struggled with backbends and shoulder openers, a friend recommend infinity strap to work on flipped grip in poses like Dancer, Bow, King Pigeon, Lunge or even Splits. Ever since I started using the infinity strap, my backbend practice has grown so much. I'm still your less bendy yogi, but I have now amazing tool to help me progress. My most favourite asana with the infinity strap is dancer. I introduce the infinity strap to my students whether we work on handbalances, backbends, shoulder openers or binds. Off the mat and away from the office you will find me taking long walks with Molly our furry baby, camping on the coast in the summer enjoying SUP, kiteboarding and surfing (trying). In the winter I dream of snowboarding trips to fresh pow pow. I still love aerial arts and acro and train when I can. Fascinated by the Ashtanga practice, I started learning the first series. After almost three years of yoga practice I still find the infinity strap extremely useful especially in those asanas that require a very intense shoulders opening (e.g. Ekapadarajakapotasana), I also use infinity strap in inversions and backbending to keep my elbows closer. Infinity strap is a big help also when I cannot bind because my hands are too far (e.g. Kurmasana) or because I am too sore or stiff and the twist and bind is simply too much. Off the mat I am a social worker: I work with asylum seekers at the moment. When I am not working I love spending time with friends, reading, listening to music, going to concerts and art exhibits. I really enjoy traveling too. One of my plans for the future is teaching yoga, I am working to make it happen. Diagnosed with Endometriosis at 11 years old, my mom wanted to help supplement my treatment by buying me a yoga DVD. I practiced yoga while pregnant with my 2 sons and daughter. I committed to a daily yoga practice in 2014 as physical and mental therapy to manage stress, severe muscle atrophy, and Chron’s Disease. I never stopped my yoga practice from there because I saw the physical health benefits and mental changes yoga gave me. After taking several yoga workshops on many different subjects, I decided to attend my 1st 200hr yoga teacher training in March of 2015. I loved teaching and learning about yoga so much that in 2017, I went to Costa Rica for a month to take a 300hr Advance YTT and completed the required hours to become a 500HR Yoga Instructor. I enjoy sharing my passion for yoga with all ages, levels, and body types while making everyone feel confident with their body and practice. I became a yoga teacher because I wanted to make a difference in the yoga community and change the stereotype of what a yoga teacher is or looked like in studios or outside of studios. I also work hard at learning all about yoga and anatomy to better help every single person I teach to practice yoga safely and at their level. I love the Infinity Strap because of its unique shape and the stability that it provides at any level or stage of your yoga practice! It helps me with Stabilizing my weak shoulders while practicing inversions and arm balances. I love to use my Infinity Strap to help me hold crow pose variations, dolphin pose to forearm stands, and even making efforts to build strength to one day press up into a handstand. When I’m feeling like a more relaxed practice, I use my strap to assist me in deepening my Eka Pada Rajakapotasana or to grab my foot in a reclined head to knee pose. When I’m not teaching or doing yoga, you can catch me hanging out with my 3 beautiful children, on a golf course with my fiancé, trying a new fitness or dance class, meditating with crystals and eating food from cultures all over the world. 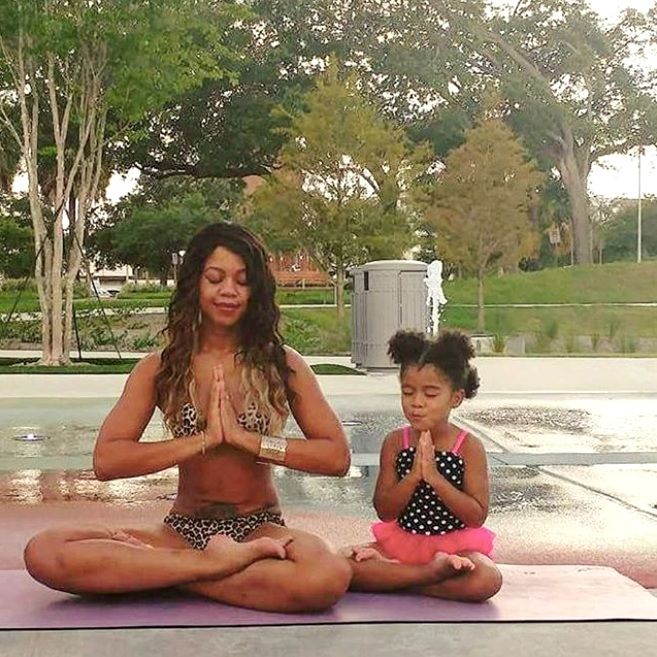 As a working mom of two, I turned to yoga as a home practice in December of 2014. Yoga practice could be intimidating sometimes, especially for someone like me who has no background in sports, dance or gymnastics. I soon learned to use props as a way to access poses to hard for me or to find proper alignment as I worked on different asanas. I began practicing Yoga in college as a way to stretch out after other sports and physical activities but it soon transformed into a lifestyle that I practice daily. Upon graduating, I took Yoga classes and fell in love with a whole new world filled like like-minded, wellness-based individuals. After a few months of deep self-practice, I experienced a sense of wanting to share the many benefits of Yoga with others who may seeking a deeper relationship with themselves and the world around them. I enrolled in a 200-hour Classical teacher training that emphasized Yoga philosophy. Since then, I have enrolled in a 300-hour Integrated Vinyasa YTT illuminating creative sequencing, anatomical integration and personal adaption. I currently host inclusive Yoga classes throughout the Seacoast of New England. It took me awhile to use Yoga props, such as blocks and straps, in my physical practice, because I was battling my ego as well as obnoxiously long straps that always seemed to get in the way of the practice, not benefit from it. Once I discovered the Infinity Yoga Strap I was hooked - I was able to utilize the strap for challenging postures without the distraction of extra material. Some of my favorite postures to incorporate my Bamboo Infinity Strap are any backbends - like Royal Pigeon- and standing balance poses - like King Dancer - because of my limited flexibility in my back, the strap can create a natural extension of my limbs that allows me to attain challenging poses. My Infinity Yoga Strap has also come in handy off the mat, especially when I forget a leash for my black lab and I can safely and harmlessly loop the strap around her collar and she’s ready to go! I started yoga about 5 years ago after I lost my mom to alcoholism, it seemed like a good outlet for me to release stress and sadness. Yoga also helped me focus on a healthy lifestyle. I was inspired to try out some of those amazing poses I saw on Pinterest, only to discover that they were much more difficult than they looked. I was taught very early on that practice makes progress and if you want to be able to do these beautiful poses you need to come everyday and put in the work and that’s exactly what I did. My favorite prop without question is my Infinity Strap, I’ve called it my best friend along my side for this entire journey. Before I started yoga I was strong but not flexible, it has allowed me to deepen poses like king pigeon and dancer, kept my open hips square in many backbends to prevent hypertension in my lower back and it has even built the confidence and muscle strength to be able to handstand press. My yoga devotion spans over 20 years. I practice many styles including Prana Vinyasa, Jivamukti and Forrest Yoga. In England and Australia, I’ve led Hot Yoga, Vinyasa, Ashtanga, Yin, Hatha and many alignment and dynamic flow based classes. I enjoy using the infinity strap to assist my super tight shoulders and get deeper into my backbends. I also like yoga blocks to help create more space, especially in trikonasana and ardha chandrasana. Blocks are also a great way to access bandhas, and to practice jumping through to Navasana. Richard started his yoga journey in 2013 and obtained his YTT the next year. He loves to use the Infinity Strap in advanced poses for stability, such as arm balances. It has also aided in opening his tight shoulders and a stiff back. Off the mat, Richard also trains crossfit. Crossfit and yoga is the best combo for Richard’s overall health and fitness. I use the Infinity Strap everytime I teach yoga in our crossfit box. 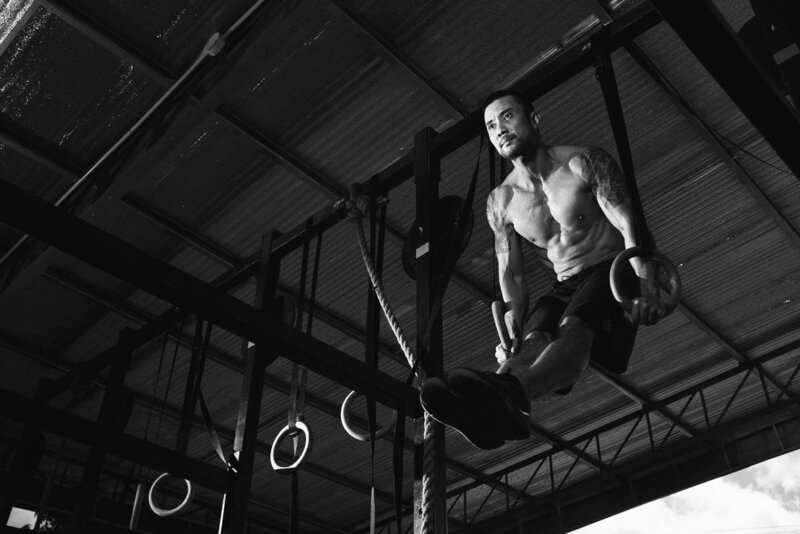 More and more crossfitters are picking up yoga because they see and feel the benefits. The strap is pretty useful to especially to the crossfitters because most of them have really tight shoulders, hammies, quads and calves.